T. Destry Jarvis is the 2019 Corps Network Legacy Achievement Award Winner. We interviewed Destry to learn more about him and his experience in the Corps movement. Click here to read his bio. Tell us about your background and where your career has taken you. One relevant thing I like to emphasize is that my father was a CCC Boy. For 18 months in the 1930s, he was a “soil soldier” as they would call them. He never talked about it much growing up, but I knew about it. I always had an interest in and soft place in my heart for service on the public lands as a consequence of that. When I was in college, it was during the Vietnam War. I was from a rural area and I would’ve been drafted out of college, so I joined ROTC and I was commissioned as second lieutenant when I graduated from the college of William and Mary in 1969. I was in the Army for three years, the last of which was in Vietnam. My wife and I were married in 1971 here in DC, where I had been stationed for two of my three years in the service. When I came back to DC in the spring of 1972 there were full-page ads in the Washington Post protesting the clubbing of baby seals in Canada. So I started volunteering with Friends of Animals for the next six months to lobby for the Marine Mammal Protection Act in Congress. 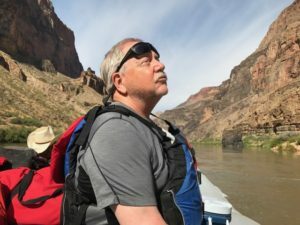 I learned the legislative process on the fly and that law went into effect in December and I was hired by National Parks Conservation Association (NPCA) in December of 1972 and worked there until December of 1988. I was the Vice President of Policy for the last half of that time and was Chief Senate Lobbyist on the Alaska Lands Act and Chief Senate Lobbyist on the first omnibus Parks and Rec Act of 1978 and did a lot of interesting things that I enjoyed. I left NPCA in the fall of 1988 and I became the Executive Vice President of the Student Conservation Association (SCA). Bill Clinton was elected President and Bruce Babbitt was named Secretary of the Interior. Bruce Babbitt and the White House picked George Frampton to be Assistant Secretary of Interior and Roger Kennedy to be Director of the National Park Service. They both asked me to come in and work for them, which I did indeed do for eight years as the Assistant Director of the Park Service for External Affairs. This included congressional affairs, public affairs, and tourism and partnerships for the first term, and then working as Senior Advisor to the Assistant Secretary, Don Berry, in the second term. At the end of the Clinton administration in January 2001, I started working for NASCC [National Association of Service and Conservation Corps – former name of The Corps Network] as the Acting Vice President of Government Affairs. I did that until the summer and then I was hired as the Executive Director of the National Recreational Park Association (NRPA). That lasted two years when my wife, who had been at the EPA all those years, retired and I set up my consulting practice at that point, which I’ve been doing since 2002. Can you talk about the Public Lands Service Coalition (PLSC) and your involvement? Not all the members of The Corps Network (TCN) do public lands work, but many do. At the time, there was a feeling that leadership at The Corps Network was not as interested in the public lands aspects of TCN’s missions as some folks thought they should be. People like Harry Bruell [former VP of NASCC and CEO of Conservation Legacy] and Jeff Parker [Executive Director of Northwest Youth] and many others wanted to form an interest group within TCN to focus on the public lands piece and they brought me on as a consultant for that. The plan was to really emphasize the work that Corps do on federal lands, and of course important work Corps do on state lands and sometimes in cities. So we formed this coalition with the idea that it wasn’t just Corps who are stakeholders; groups like NPCA joined to help advocate on behalf of more service work happening on public lands. How did you become involved with Service and Conservation Corps? When I was first hired, I was to open their first office in DC and become principally responsible for government affairs and new ventures. I started something called the Conservation Career Development Program, which was intended to recruit young people of color and put them into a conservation career track starting with a Corps experience. Of the two big things I did while I was at SCA, one was to get a budget line item in the park service appropriations specific to SCA. The other was to lobby for passage of the National Community Service Act, which includes a section on Public Lands Corps. I wrote that part of the legislation along with Sandy Scott, who now works for the Corporation for National and Community Service and who was then committee staff on Capitol Hill. Sandy and I put that together and got it into Clinton’s broader AmeriCorps package. By the time it passed, I had left SCA and went to the signing ceremony at the White House in my National Park Service uniform. Another little anecdote: at the point when Clinton was elected for the second term, Roger Kennedy had left and Bob Stanton had not come in yet as director of the Park Service. So we didn’t have a Director but I was still the Assistant Director. So, one day the White House called up and said the president is going to have a big conference up in Philly and wants to announce new initiatives. Just prior to that time, Congress had enacted legislation which allowed the park service to retain their entrance fee money and not send it to the treasury like it had always done before. The Park Service was flush with fee money at that point, so on a spur of the moment,” I said the Park Service would devote a million dollars out of our recreation fee money to support the expansion of youth services in parks. The White House said great and the president announced it the next week. Bob Stanton came in as the new Director of the Park Service the week after that and I said “Hey Bob, guess what I did?” He said, “Great! I’m going to expand it to five million.” Since then, we have been varying between five and seven million a year of the 20% of recreation fees distributed by NPS headquarters to the parks, devoted to youth service projects. Who are some of your personal and/or professional heroes? During my time with NPCA, and continuing on to the present, I worked very closely with all of the Directors of the Park Service. My two favorites – excluding my brother, whom I was not allowed to communicate much with while he was Director – were Bill Whalen, who was director in the Carter administration, and Bill Mott who was director during the second Reagan term. Bill Whalen came up through the parks and Bill Mott had been the state park director in California and was a board member of NPCA. Mott in particular had a tough road because most of the people who were appointed above him in Interior could not care less about the integrity of the National Park System. He fought with them constantly, but they couldn’t fire him because he was good buddies with President Reagan. So as far as parks are concerned, there are a bunch of superintendents that I’ve respected and admired: Boyd Evison, who was superintendent of Great Smoky Mountains and Regional Director in Alaska, among other things. Bob Barbee who was superintendent at the Redwood National Park and then at Yellowstone before he retired. Roger Contor, who was Superintendent at Rocky Mountain National Park and Associate Director in Washington. All were really terrific, professional park managers. There have been three or four members of Congress that I got to know really well over the years for various things. Phil Burton from California and Bruce Vento from Minnesota were at different times chairman of the National Parks Committee in the House and they were both fantastic people. Burton had probably never spent a day outside in his life, but he really got what parks and public lands were about. He was an amazingly effective legislator. As far as my professional life is concerned, those are my heroes. There are a lot of authors who I would also call heroes. I collect books. I have a 2,000-volume collection of conservation-related first editions. They’re mostly non-fiction, but there are some who write fiction who are crusaders nonetheless about conservation. One of whom is Carl Hiaasen, who writes for the Miami Herald and also wrote a whole string of novels, among my favorite of which is “Stormy Weather.” Others include John Muir and John Burroughs, who was the most popular writer at the turn of the 20th century; there were more copies of his books in public schools in America than any other writer. He was a close personal friend of Theodore Roosevelt. When Roosevelt traveled to parks, Burroughs traveled with him. There are a couple dozen other authors I revere for their eloquent writing in the defense of the land and nature. Among the more modern nature writers I like are Robert Cahn, Paul Schullery, Rick Bass, Hal Rothman, Barry Lopez, Stephen Jay Gould, Ann Zwinger, Kim Heacox, David Gessner, David Quammen and Timothy Egan. Of your books, is there a prized possession? I have a first edition of Silent Spring, – Rachel Carson’s book. I also have a first edition of The Monkey Wrench Gang, Edward Abbey’s classic novel. His famous non-fiction book is Desert Solitaire. It’s about his time as a ranger in Arches National Park. What is the primary piece of wisdom you would give to a young person interested in a career in resource management? Stick to it. I think you need to find a mentor or several. People who have been there, done that. People who have experience and will encourage you, stimulate you, and give you opportunities to grow and expand your horizons. Also, when I was at NPCA and working as a full-time lobbyist, people asked me what it took to be a lobbyist and I said the most important thing is not just to know the issues. The most important thing is to speak well and write well, and then you can learn the legislative process. That’s easy. Being able to put your views into succinct words either on paper, or on a computer, or orally, is the most important thing. What is the primary piece of advice you would give to staff at Corps? One thing I would say about working in this town, and I think it’s true for any organization, is don’t burn out. When I started at NPCA in 1972, there was a cadre of probably 20 people just like me in their mid-20s who were focused and devoted to the cause. By the time I left NPCA 18 years later, all of them had left the conservation field or left the NGO conservation field because they were burnt out. Because they were so passionate about the thing they were doing at the moment, they didn’t have good work-life balance. Do not burn yourselves out. Be as I am – a reluctant enthusiast….a part-time crusader, a half-hearted fanatic. Save the other half of yourselves and your lives for pleasure and adventure. It is not enough to fight for the land; it is even more important to enjoy it. While you can. While it’s still here. So get out there and hunt and fish and mess around with your friends, ramble out yonder and explore the forests, climb the mountains, bag the peaks, run the rivers, breathe deep of that yet sweet and lucid air, sit quietly for a while and contemplate the precious stillness, the lovely, mysterious, and awesome space. Enjoy yourselves, keep your brain in your head and your head firmly attached to the body, the body active and alive, and I promise you this much; I promise you this one sweet victory over our enemies, over those desk-bound men and women with their hearts in a safe deposit box, and their eyes hypnotized by desk calculators. I promise you this; You will outlive the bastards. I’ve found that finding the right work-life balance is so important because as you move through a career, your knowledge and experience and capabilities are growing constantly. If you cut it short, mid career, all that accumulated knowledge is lost. But if you persevere and pace yourself, you’ll contribute more towards the preservation of the world. In the future, what developments would you like to see happen in the Corps movement? More Corps in more places. We have around 130 now, but they aren’t everywhere and everywhere needs them. One of my gripes about our federal partners is that too many of them still think of Corps as nice to have, not need to have. They don’t quite acknowledge their essential role. It’s not just in getting work done; it’s that Corps create positive public opinions for public lands and for public lands agencies. It’s young people, it’s that lively enthusiasm that young people have for what they are doing. They are the next generation, and the agencies sometimes seem loathe to acknowledge it. Legacy is a grand term. I don’t think of my work much in terms of a legacy. I feel like I’ve been in a place to accomplish some things. In the greater scheme of the world, they were minor things, but for conservation policy, they were useful things. One example: there’s a provision in the 1998 National Parks Omnibus Management Act, which is principally focused on concessions reform. This is something I started working on in 1972 and it took until 1998 to repeal the 1965 concessions act and replace it with a more proper business model. More importantly, I wrote a section that no one ever questioned. I worked it out with committee staff, and it was never discussed in committee except to acknowledge that it was there, but it’s basically a mandate to the Park Service to manage the parks based on sound science. It set up the cooperative ecosystems study unit relationship between the park service and universities across the country and did a couple of other things that were really important and it surprised a lot of people.